Using antibiotics, especially over long periods or at high doses. Inhaling corticosteroid medicines (brown inhalers), which are used to treat Asthma. Suffering from dry mouth, which is either caused by a medical condition or as a resulting side-effect from certain medicines. Receiving chemotherapy or radiotherapy to treat cancer. Oral thrush is not contagious in the same way a cold is. However, it can be caught through direct contact with the infection, such as kissing. The condition is more likely to affect babies, children, the elderly and those with an underlying condition that makes them more prone to the infection. These conditions include; diabetes, hypothyroidism (underactive thyroid), HIV, and iron/vitamin B12 deficiencies. Oral thrush is not usually serious and can be successfully treated with a range of antifungal medicines. Plaques (white patches), which are found inside the mouth. These can usually be wiped off, leaving behind red patches that are prone to bleed. Redness inside the mouth and throat. An unpleasant taste or a loss of taste in the mouth. Cracks can occur on the corners of the mouth. A burning sensation inside the mouth. For some sufferers, these symptoms can make eating and drinking more difficult. How is Oral Thrush diagnosed? Most simple cases of oral thrush can be self-diagnosed based on recognisable symptoms however, you should consult a doctor if the symptoms of oral thrush do not respond to treatment. If left untreated, the symptoms will most likely persist, leaving the mouth feeling very uncomfortable. In more severe cases, there is the risk of the infection spreading further into the body, which can potentially be more serious. A doctor will usually be able to diagnose oral thrush through a simple visual inspection of the mouth. In some cases, a blood test may be required so that any underlying conditions can either be identified or ruled out. Oral Candidiasis can be successfully treated with anti-fungal medicines. Typically, these medicines will be in a gel or liquid form, which allows for direct application inside of the mouth. Topical oral thrush treatments like these usually need to be applied several times daily for up to two weeks. 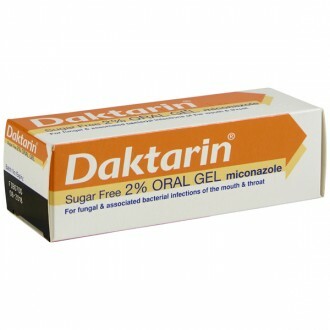 An example of an oral thrush treatment available over-the-counter is Daktarin Oral Gel. However, for more severe or persistent infections, tablets or capsules are also available after having consulted with your doctor. Tablet and capsule alternatives are typically taken just once daily. How can I prevent Oral Thrush? Practising good oral hygiene (brushing with a fluoride toothpaste twice a day with regular interdental cleaning). Regularly visiting a dentist for check-ups. This also applies for those who wear dentures and for those who have no natural teeth. Rinsing your mouth after eating snacks and meals. Removing dentures at night and cleaning them thoroughly using a paste/soap and water soaking method. If you wear dentures or have little/no natural teeth, it is recommended to gently brush the gums, tongue and the inside of the mouth, twice daily using a soft bristled toothbrush. If you are asthmatic, rinsing your mouth with water after using a corticosteroid inhaler (a brown reliever inhaler). Also, using a spacer with these inhalers will help reduce the risk of contracting oral thrush. If you suffer with a medical condition, such as diabetes, ensuring it is well managed will help reduce the risk of infection. If you are beginning a course of treatment that will increase the risk of developing oral thrush, such as high strength antibiotics, anti-fungal medication may be recommended as a preventative measure. Oral thrush is a fungal infection that affects the mouth and throat. The infection is caused by a group of yeasts called candida. Oral thrush is sometimes referred to as oropharyngeal candidiasis. The condition will cause small white bumps to form inside the cheeks and on the tongue, which will usually cause the sufferer some level of discomfort. Typically, oral thrush is a mild fungal infection that rarely causes complications. Why do I have Oral Thrush? A naturally occurring fungus called candida can be found in the mouths and digestive systems of most people. Usually this fungus doesn’t cause any harm unless their numbers multiply. When candida multiplies beyond normal levels it can lead to oral thrush. Taking a prescribed course of antibiotics, especially in high doses or over long periods of time. Using inhaled corticosteroids medication for asthma. Having poor levels of oral hygiene. Being a denture wearer, especially if they are ill-fitting. Having a dry mouth, either as the result of a medical condition, or as a side-effect of medication. What are the most common symptoms of Oral Thrush? Plaques, which are white patches or bumps in side the mouth. These patches can often be wiped off, leaving behind red areas that are prone to bleeding. A loss of taste in the mouth. A burning pain inside the mouth. Redness of the mouth and throat. Cracks appearing at the corners of the mouth. A difficulty in eating and drinking. Do I need to visit my GP? It is recommended you visit your GP should you present with the symptoms of oral thrush. If left untreated, the symptoms can persist. In more severe cases, untreated oral thrush can carry the risk of the infection spreading further into the body, which can potentially be serious. In most cases, your GP will be able to diagnose oral thrush with a simple visual examination. The doctor may also take a small scraping from one of the infected plaques in the mouth. This can then be sent to a laboratory, where it can be tested for the presence of the candida fungus. In some cases, the doctor may recommend a blood test, which will help identify any associated condition, such as nutritional deficiencies or diabetes. Oral thrush is not contagious in the same way a cold or the flu is. However, under certain circumstances it can still be passed on. It is possible to contract oral thrush through oral contact with an infected person. Though this will depend on the strength of your immune system and whether there are other risk factors at play. For this reason it is advised to avoid oral contact, such as kissing, until the symptoms have fully resolved. Oral thrush, in most cases, isn’t dangerous. Though if left untreated it can potentially spread further into the body, which can make the condition more serious. However, this usually only happens in severe cases, and for those with weakened immune systems. Will I need to treat Oral Thrush? It is recommended to seek treatment for oral thrush as the infection can make the sufferer feel very uncomfortable. If left untreated, the condition will likely persist. Plus, if the infection spreads to other areas of the body it can cause further complications. What treatments are avaliable for Oral Thrush? Oral thrush can be successfully treated with topical antifungal medicines. These are typically in the form of a gel of liquid, allowing for direct application to the infected area. Topical medications, such as gels or liquids, will usually need to be used several times daily, for approximately 1-2 weeks. Brushing teeth with a soft-bristled toothbrush, as to avoid scraping the plaques. Replacing your toothbrush daily, until the infection has cleared. Avoid using mouthwashes and sprays. Use a saltwater mixture for rinsing your mouth. Do Oral Thrush treatments have side-effects? Oral thrush medications don’t often carry side-effects, although some have been known to cause nausea, vomiting, diarrhoea and bloating. Can I use Oral Thrush treatment if I am pregnant? If you are pregnant, it is recommended you speak to your doctor or pharmacist before attempting treatment. Oral thrush is usually safe to treat using topical preparations, such as gels. However, capsules or tablets should be avoided if; you’re pregnant, trying to get pregnant, or are breastfeeding. What can I do to prevent Oral Thrush? Brush teeth at least twice daily, using a toothpaste containing fluoride. Floss daily, especially if you are a denture wearer, or are diabetic. Rinsing your mouth after meals. If a denture wearer; remove, clean and soak the dentures every night. Also, ensure your dentures fit properly. If you use a corticosteroid inhaler, it is important to rinse out your mouth after each use. If taking prescribed antibiotics, add yogurt to your diet for the duration of the course. If suffering from a vaginal yeast infection, ensure it is treated promptly, especially if you’re pregnant. Ensure any underlying condition, such as diabetes, is well controlled. If you suffer from, or are receiving treatment for a condition that puts you at a higher risk of developing oral thrush, your doctor can recommend taking a course of prescribed antifungals to help prevent oral thrush from developing.